As everyone is well aware, it is illegal to drive whilst conducting a call on your mobile phone, unless of course it’s a hands free. The fine today is £100 and 3 penalty points! Lots of the hands free kits on the market today involve having a unit around your ear (most uncomfortable), or a unit that plugs into the cigarette lighter with an inbuilt speaker, Which you struggle to hear the caller, the other type is a sun visor clip on Bluetooth module, very quiet and batteries don’t last plus caller cant hear you clearly. At Whitehorse Auto Styling we can offer Bluetooth hands free kits fitted to your vehicle via your radio system. all calls will be routed through your cars speakers and music will be muted automatically. some hands free kits even offer iPod/iPhone and USB connections. 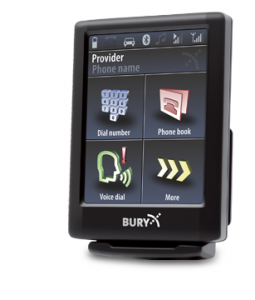 Below is a selection of hands free kits we can install into your vehicle. 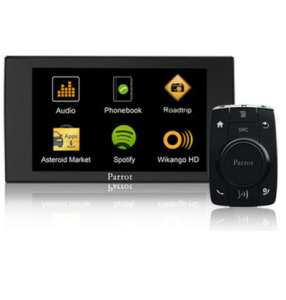 The Parrot ASTEROID Mini Handsfree Multimedia System is a hands-free multimedia system that fits in all vehicles in addition to an existing audio system. 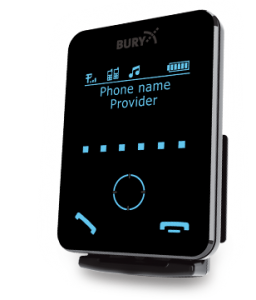 Like all products from the ASTEROID range, it offers driving assistance applications, access to all your music sources and hands-free features, it is distinguished by its 3.2” colour display and its wireless remote. Connectivity: iPod / iPhone, USB, line-in, Bluetooth (A2DP).